Here we are, already nearly at the end of another year. I hate/love how fast the time is going--soon it will be winter break and I can't wait for this semester to be over! This month I have a lot of pop culture favorites and not a lot of beauty favorites, which is a first! For years people have raved about this holiday Lush scent. I've got plenty of shower gels, but an in-shower conditioner sounded like something I could really use. The scent is not my absolute favorite, I find it a bit too strong and sweet, but when I'm out of the shower I love the way it lingers. I use it mostly on my legs and then take any remainder over my arms and the rest of my body, and it feels really moisturizing and nice! My former favorite NARS concealer is on it's last legs, and because I didn't have a great replacement I decided to try this cult-favorite out. I think I might like it even more than the NARS Radiant Creamy! It has pretty high coverage and blends out easily, which I prefer over the Tarte Shape Tape because it can be hard to blend. I've been slowly watching HIMYM over the past few months and I finally finished it. It's about a father telling his kids the story of how he met their mom, and all the adventures and ups-and-downs he had along the way with his friends and girlfriends. Overall I loved the show, but hated the ending! The two characters I wanted to end up together didn't. If you've seen it you hopefully know who I'm talking about! I guess I've been on a real comedy kick, but the Office has become my new go-to since I finished HIMYM. I'd seen the first ten episodes or so and didn't think it was that great, but because so many people rave about it I decided to give the show a second chance and I'm finding it really funny! I love Jim and Pam, and all the other characters make me laugh, too. It's set in a small paper manufacturing office and is a documentary-style. Speaking of documentary-style comedies...not many people talk about this Netflix original, but they should! American Vandal is a parody of other crime-based documentaries like Making a Murderer, and follows a boy who is getting expelled for allegedly spray painting a bunch of teacher's cars. Another student makes a documentary to try to prove him innocent by discrediting the witnesses, analyzing the spray-painting style, and it all adds up to be surprisingly funny. Around this time of year I try to spend a lot of my time reading. I'm traveling a lot to visit family, and this is the book I've been taking with me. I'm not done with it yet, but it's so intriguing that I had to mention it. It follows a poor boy from California named Richard who goes to college on the East Coast and joins an exclusive group of students in studying Greek with a mysterious professor. In the prologue, the reader learns that the group of friends kill one of the boys in the group, but you don't know why. I can't wait to finish it; I just need to find the time! I recently joined a book club and this was the book that we decided to read this month. I was hesitant at first because I'm not usually a fan of historical fiction set in the 1900s, but this book followed a topic I had no knowledge of: orphan trains. Just before and during the Great Depression, orphans from the cities would be gathered up and sent west to join new families. The families often took them in as child labor, not as a new child. The story follows a young Irish girl as she joins a few different families and the difficulties she had there. In the present day, a foster-care girl hears the story, too. I didn't love the ending but the rest of the book was great. And finally...if you've been following my blog for a while you'll know that I'm a big Taylor Swift fan. I know a lot of people don't like her at the moment, but her music is my favorite. Reputation dropped this month and I picked it up right away! It's definitely darker for Taylor, and I don't think it's my favorite of her albums, but there are some amazing songs on it. I think my favorites are Don't Blame Me, Getaway Car, I Did Something Bad, So It Goes, and Call it What you Want. Yes, I'm aware that I just listed half the album. It's just really, really good. If you're a fan of pop music you should check it out! My least favorite songs are probably Delicate and Gorgeous. 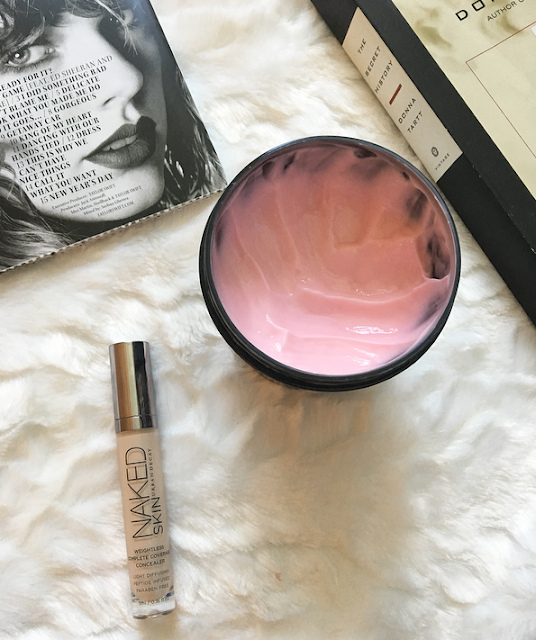 7 comments on "November Favorites"
I've been really tempted to try naked skin! It looks great, might be my next concealer purchase! I've been thinking about trying the Urban Decay concealer. I'm happy to hear that it's easy to blend out. The Orphan Train was a good read, it was hard to read how these children were treated. Ahhhh I can imagine how amazing the Lush product smells. It's sosad that we don't have the store anymore. 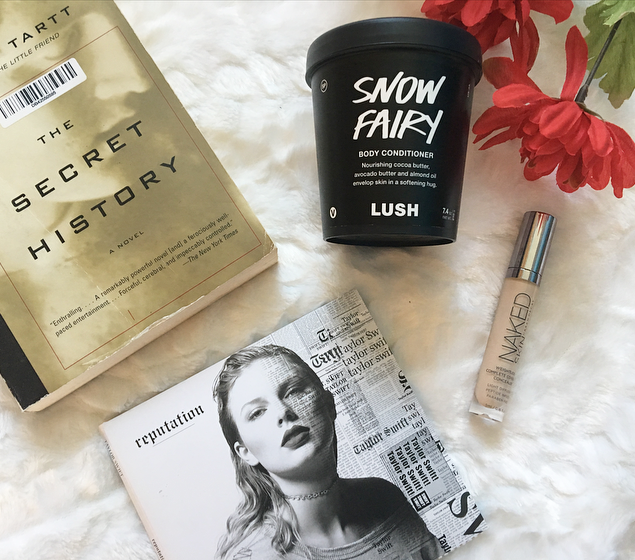 Snow Fairy is definitely a scent that I get sick of really quickly, haha. I bet it's better when it's only a lingering scent throughout the day. Great picks!